Braun is a name lots of people trust when it comes to personal care products and small appliances. The brand has been producing a line of epilators for several decades now, ever since it bought out a French brand, Silk-épil. 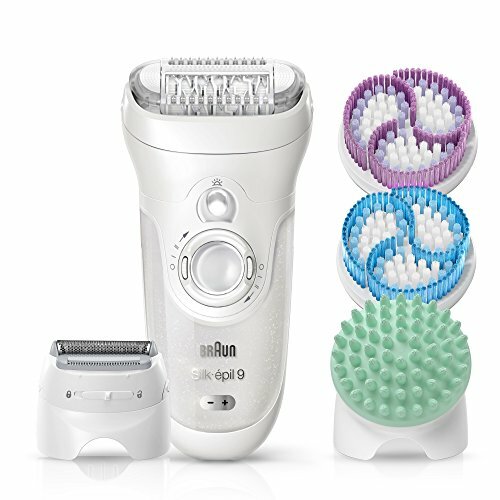 So which the brand’s products is the best Braun epilator? We’ve taken a close look at several of the brand’s epilator series and have picked out the best of the best for you. Braun has several series of epilators, 3, 5, 7 and 9. Each series gets more and more complicated and offers a greater and greater number of attachments and features. But at their heart, the best Braun epilators have many of the same things in common. You’ll find a light and multiple speed options on each model, for example. Epilator head. The 9 series boasts the largest head of all of Braun’s epilators. That means it can remove more hairs at once. Number of tweezers. Most of Braun’s epilators have at least 40 tweezers. The exception is the 3 series, which has just 20, making it a better bet for beginners. Corded/cordless. Braun’s epilators that are meant for use wet or dry are cordless and fully waterproof. The 5 and 3 series models are corded, meaning you can’t use them in water. 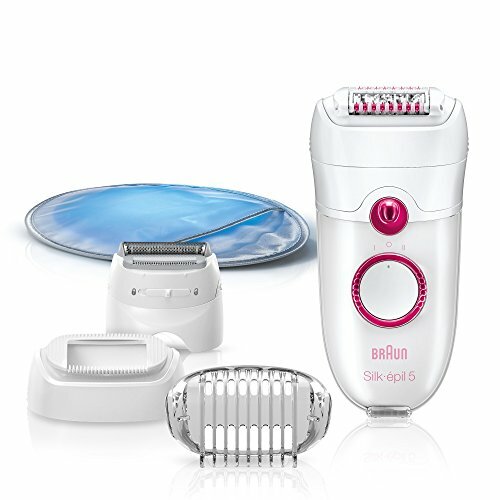 Also known as the SkinSpa, the Braun Silk-épil 9 includes several exfoliation brushes and additional attachments to make your epilation experience as pleasant as possible. One of the major claims for fame for Braun’s 9 series is that the head is 40 percent wider than on other models. That can be both good and bad. It’s good because it means the epilator can remove more hair in one go. It’s not so good because removing that much hair all at once might be too intense for beginners. If you’re wondering why an epilator would need to come with several exfoliation brushes, here’s why. Removing the top layer of dead skin cells before you epilate helps to reduce the risk for ingrown hairs. Having the exfoliation tools included with your epilator means that the device is a one-stop shop for all your hair removal and skin care needs. People who have used the Silk-épil 9 961 SkinSpa have called it the best Braun epilator that they’ve used. Some are quick to note that the number of attachments it comes with does seem excessive, though. Others also note that the device was just a little too intense for them. If you’re a beginner and have never epilated before, it’s probably best to start off with something a little smaller. The Braun Silk-épil 7 7521 doesn’t have nearly as many bells and whistles as its more sophisticated cousin the Silk-épil 9. But that doesn’t mean that it’s any less good of an epilator. In fact, the 7 series is one of the best Braun epilators because it’s purely focused on the act of epilating. The product’s claim to fame is that it works on very short hairs — as short as 0.5 mm. It’s also fully waterproof so that you can use it in the bath or shower. Beginners often find that epilating with water creates a more comfortable experience. Although it doesn’t have brush attachments, the Silk-épil 7 7521 does come with several caps and attachments. There’s a massaging cap to help improve the health of your skin and an efficiency cap to enhance the epilation experience. People who have used the Silk-épil 7 have mainly been happy with the results it’s provided, with many noting that it helps to reduce hair regrowth. Not everyone who’s used the device is thrilled, though. Some have noted that instead of pulling the hair out from the root, the Silk-épil 7 is better at breaking the hair off. Others have also complained about the level of pain associated with using the epilator. But since epilation does involve pulling hair out by the follicles, a bit of discomfort should be expected. With the Braun Silk-épil 5 Power 5280, we’re getting near the lower end of Braun’s range of epilators. But don’t think that “lower end” means “lower quality” in this case. The Silk-épil 5 still has a lot to offer. There are 40 tweezers on the epilator head, and those tweezers are capable of removing hairs as short as 0.5 mm. The Silk-épil 5 5280 comes with more attachments than the Silk-épil 7 7521. Along with the efficiency cap, there’s a trimmer cap and a shaver attachment. There’s also a cooling glove, which is meant to help soothe irritated skin after you epilate. To be honest, we’re not quite sure how useful the shaver cap is. If you’re buying an epilator, aren’t you more interested in epilation rather than shaving? But if you’d still like the option of being able to shave when needed, we guess having that attachment is a benefit. People who have used the Silk-épil 5 5280 have noted that, yes, it does hurt an awful lot. But they’ve also pointed out that the cooling glove does help to soothe any discomfort. 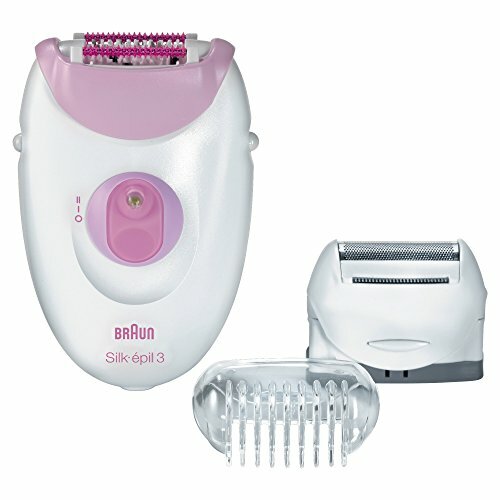 The Silk-épil 3 3270 is the starter epilator in the Braun family. It’s simple and doesn’t have a ton of features. But if you’re trying epilation for the first time and don’t want to spend more than $50 on a device, it’s a great option. The Silk-épil 3 has 20 tweezers and is recommended for use on legs. We also find that the small number of tweezers and the relatively small head size make it ideal for use on more delicate areas, such as the bikini line and underarms. 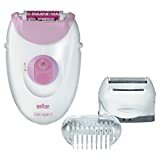 People who have used the Silk-épil 3 have noted that it’s effective at removing hairs and that it does as good of a job at the higher end Braun series models for a considerably lower price tag. Can only be used under dry conditions. Why Choose a Braun Epilator? Lots of companies make epilators, so what makes Braun one of the best? For one thing, the company has an established history of innovation, dating back to its founding in the early 20th century. The company entered the hair removal business in the 1980s when it introduced a line of shavers. Later on, Braun acquired the French brand Silk-épil and took over production of its line of epilators. Under the Braun name, Silk-épil epilators became the top-selling hair removal products for women. Today, Braun has four distinct epilator lines. Each line varies in complexity and the number of features offered. The most advanced line, the Silk-épil 9, often comes with a range of attachments and “bells and whistles.” The least sophisticated series, the Silk-épil 3, is the “entry-level” category. So which one is best for you? It depends on what you’re looking for in the epilation experience. If you’re going for full-body epilation, you’re likely going to want to choose the 9 series. Epilators in the 7 and 5 series might also be sufficient for your needs, but they won’t have as many extras as products in the 9 series. If you’re just dipping your toes into the epilation waters and don’t want to shell out the big bucks for a device, the Silk-épil 3 might be perfect. The 3 series is the simplest one available from Braun. It’s smaller and is primarily meant for use on the legs. 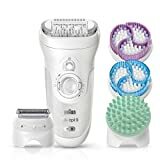 You don’t get cool features, such as a facial cleansing brush, with the Silk-épil 3 but you do get reliable quality and the opportunity to see if epilation is right for you. Why even bother with epilation in the first place? Well, compared to shaving or waxing, two of the more popular hair removal options, epilation has a few benefits. It’s long-lasting. Although you might need to epilate more at the beginning, the results from epilation can last for as long as four weeks. It works on short hair. The trouble with waxing is that you need to let the hair grow to at least 2 mm (1/4 inch). Epilators can grab and remove hairs that are as short as 0.5 mm. You can do it all over. You can use an epilator anywhere you have unwanted body hair, from the legs to the face and from the underarms to the bikini area. It affects hair growth. After repeated use, you’re likely to notice that your hair no longer grows as thickly as it once did. Because epilation removes the hair from the root or follicle, new hairs tend to come in finer and thinner. Depending on which best Braun epilator you choose, you often have the choice of using the device under wet or dry conditions. Some people believe that using an epilator on wet skin, such as in the bath or shower, is easiest. 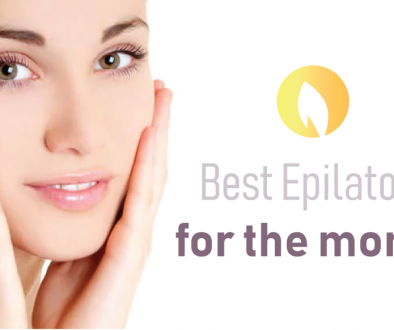 But others believe that using an epilator on dry skin provides better results. Regardless of whether you go wet or dry, the technique is the same. You should hold the device perpendicular to the skin so that the epilator head is flat against the skin. When you epilate, you’ll have a more comfortable experience and will get better results if you pull the skin taut as you go. Trust us, the last thing you want is for a tiny piece of skin to get caught between the tweezer blades. We recommend starting out with a less sensitive area when you’re a beginner. 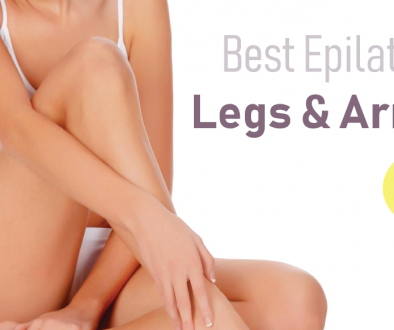 Try epilating your legs first, rather than an area like the bikini line or the underarms. As you get more confident using your Braun epilator, you can branch out and remove hair from other areas of the body. Which is the best Braun epilator? We’re going to go with the Braun Silk-épil 9 9-961V Women’s Epilator, and here’s why. 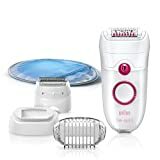 The 9 series epilator has pretty much everything you need to comfortably and efficiently remove unwanted hair. Its large size might seem a bit much for beginners, but the device does include caps to cover up the tweezers. 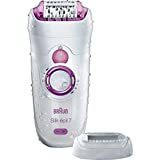 Since it’s suitable for more advanced epilators and can be used by beginners, we recommend the Braun Silk-épil 9 9-961V Women’s Epilator as the best Braun epilator available.